Our mission at Forest Lake Doctors is to provide the highest standard of patient care while incorporating a holistic approach towards the diagnosis and treatment of illness. Our team here is committed to promoting health, wellbeing and prevention of disease for all patients. We do not discriminate in any manner in the provision of excellent care as well as aim to treat all patients with dignity and respect. 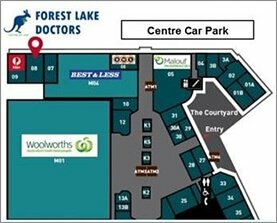 At Forest Lake Doctors we prefer to work though an appointment system to ensure we give our equal time and service to all patients and that the patients never have to wait for treatment. Our appointment services, broadly classified into two main categories – general appointment and online appointment. For general appointment you can reach us by phone; call us directly on 07) 3278 8877, and our phones are open from 8:00am onwards and you can call us to book an appointment with the concerned doctor. For online appointments you can register with our ONLINE APPOINTMENT BOOKING system and make appointments through this website or through your smart phone. Usually most of our appointments last for 10 to 15 minutes but there might be the cases where the schedule might be shifted from above 15 minutes. Also, in case of any medical emergencies our priority will be to take the case, while yours might be out on hold for some time. Though we make sure you are provided a replacement of the doctor immediately, there might still be a chance that you have to wait. We have our sincere apologies if you ever have to wait to avail our services; also if there is a case where you have to cancel an appointment with us at Forest Lake Doctors you can cancel it over a call with us. For the convenience of the patients we offer 100% bulk billed services at any time of the week for Medicare rebatable consultations as long you still hold the Medicare card. Also, we request you to please contact our reception for more information about the fees; when you arrive for the appointment please make sure to present us your Medicare card so we can provide you our bulk billed service. In order to monitor your health and to satisfy our legal and ethical responsibilities, we at Forest Lake Doctors require that you attend your doctor or any other doctor practicing if your current doctor is unavailable in order to receive results, or to obtain further prescriptions or referrals needed. Our practice at Forest Lake Doctors is intended to promote good health through preventive medicine; therefore, we follow a recall system or a reminder system as you may know it. From time to time we will contact you, offering preventive health care services appropriate for you. You can further discuss any of these with your doctor in case of any queries about the system. You may telephone your doctor during the most operational hours, a message will be taken and given to the doctor. To protect your privacy, our general practice operates strictly in agreement with the Privacy Act (1988). The patient’s information is kept private and confidentiality of patient information is maintained at all times. The information that is collected by this practice in giving health services is considered to be private and confidential. We use this information to manage your personal health care. We generally disclose the selected information to various other health services that are involved with us in supporting your health care management (e.g. pathology, x-ray). The rights of every patient are respected and if you have any questions about how we handle your personal information please feel free to talk to our practice manager or your doctor. We have sufficient car parking space nearby and, and we have a sincere request that you use this car park to avoid parking on the main road. The car park also has disability parking for those who require it. Our practice has been designed for wheelchair access. Should you have any special needs please discuss them with your Doctor and get the wheelchair access for yourself. At Forest Lake Doctors we have zero tolerance to any form of violence in the workplace. Our staff is always ready to take care of those who need it but any form of abuse or attack will not be tolerated. We also hold the right and the authority to refuse medical treatment to abusive patients, also such matters will be reported to the police immediately and if needed the medical center may also file a legal case against the accused. Our primary concern is the patients that we’re responsible for treating; our practitioners believe in sincerely ‘caring for you.’ Our efforts are always made in the direction to provide you the best medical assistance at all times without ever failing to meet your expectations. In return of our services we expect you to give us a feedback so we may exactly be able to decipher how far we have come in trying to provide undaunted medical services to the patients in our medical center. We believe problems are best dealt within our practice. However, if you feel the need to discuss the matter outside the practice, you may contact The Medical Registration Board, AMA or Health Care Complaints Commissions. However, if you feel the need to discuss the matter outside the practice, you may contact The Medical Registration Board, AMA or Health Care Complaints Commissions.